NAIDOC Week is predominantly held in the first full week of July and is a time to celebrate Aboriginal history, culture and achievements. The 2019 National NAIDOC Theme is "Voice. Treaty. Truth. Let’s work together for a shared future". Voice, treaty and truth were three key elements to the reforms set out in the Uluru Statement from the Heart. These reforms represent the unified position of First Nations Australians. It is also an opportunity to hear Australia's Aboriginal voice with this year being the UN’s International Year of Indigenous Languages. NAIDOC Week is from 7 – 14 July 2019. The host city is Canberra. NAIDOC stands for National Aborigines and Islanders Day Observance Committee. From 1938 until 1955, the Day of Mourning, also known as Aborigines Day, was held annually on Australia Day in protest. In 1955 Aborigines Day was shifted to the first Sunday in July after it was decided the day should be a celebration of Aboriginal culture rather than a protest. Major Aboriginal organisations, state and federal governments, and a number of church groups all supported the formation of, the National Aborigines Day Observance Committee (NADOC, without the 'I'). This committee was responsible for organising national activities. At the same time, the second Sunday in July became a day of remembrance for Aboriginal people and their heritage. In 1975, it was decided that the event should cover a week. With a growing awareness of the distinct cultural histories of Aboriginal and Torres Strait Islander peoples, NADOC was expanded to also recognise Torres Strait Islander people and culture. In 1991 the committee became known as the National Aborigines and Islanders Day Observance Committee (NAIDOC). This new name is now the title for the whole week, not just the day. What happens during NAIDOC Week? Each year, a new theme is chosen to reflect the important issues and events for NAIDOC Week. NAIDOC Week celebrations are held across Australia to celebrate the history, culture and achievements of Aboriginal and Torres Strait Islander peoples. NAIDOC is celebrated not only in Aboriginal communities, but by Australians from all walks of life. Local community celebrations during NAIDOC Week are encouraged and often organised by communities, government agencies, local councils, schools and workplaces. The Committee makes key decisions on national NAIDOC activities including the host city, the theme and the National NAIDOC Poster Competition winner. At the end of every NAIDOC Week, the National NAIDOC Awards are announced at a ceremony and ball held in the host city. The annual NAIDOC Awards recognise the outstanding contributions that Aboriginal Australians make to improve the lives of Aboriginal people in their communities and beyond, or to promote Aboriginal issues in the wider community, or the excellence they’ve shown in their chosen field. For many Aboriginal people a NAIDOC ball is the highlight of the year and they travel hundreds to kilometres to reconnect with their families, to network and meet other members of their communities. For some Aboriginal people, NAIDOC Week is less about their achievements and more about their ongoing struggle. "The bare bones of what NAIDOC week is really about... is about the people that came before us, who were fed the f*** up with being classed as animals and plants, people who were smacked down every time they tried to change their lot in life," says an Aboriginal woman in a blog article . 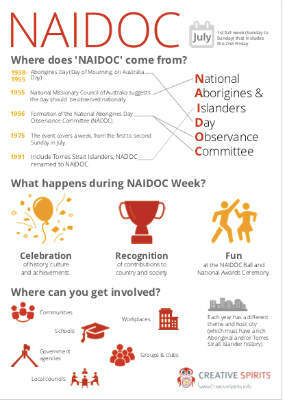 What can you do during NAIDOC Week? Display the NAIDOC Poster or other Aboriginal posters around your classroom or workplace. Start your own hall of fame featuring Aboriginal role models. Listen to Aboriginal musicians or watch a movie about Aboriginal history. Make your own Aboriginal trivia quiz. Study a famous Aboriginal Australian. Research the traditional Aboriginal owners of your area. Study Aboriginal arts and crafts. Create your own Aboriginal art. Run an art competition for your school or community. Research Aboriginal history online or visit you library to find books about Aboriginal peoples. Visit local Aboriginal sites of significance or interest. Learn the meanings of local or national Aboriginal place names and words. Invite local Aboriginal Elders to speak or give a Welcome to Country at your school or workplace. Invite an Aboriginal sports person or artist to visit you. Invite Aboriginal dancers to perform. Host a community BBQ or luncheon. Hold a flag raising ceremony. For more information and current dates visit www.naidoc.org.au. A poem by Jonathan Hill, Old Erowal Bay, New South Wales.